Woodbury Police Chief Tony Burnett is leaving the position next month to work for the Governor's Highway Safety Office. Woodbury Police Chief Tony Burnett made official this morning what has been rumored about town for the last few weeks. Chief Burnett submitted his resignation to Woodbury Mayor Harold Patrick at City Hall. The chief was offered and has accepted a position as a Law Enforcement Liaison with the Governor’s Highway Safety Office. His last official day as chief will be March 15. “I want to take this opportunity to thank the Town of Woodbury for the opportunity of being Chief of Police for the last seven years. This town has been very gracious and supportive of me during this time and I am most thankful for the opportunity to serve as Chief,” Burnett said in the letter to Mayor Patrick. 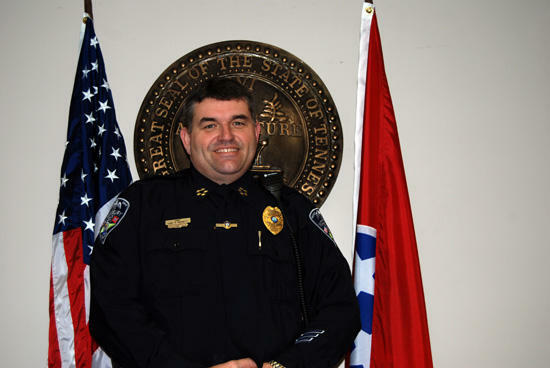 Mayor Patrick said Chief Burnett, who he has known for most of the chief’s life and who also worked as an EMT and a Cannon County deputy before joining the police department, has served the Town of Woodbury well. “Tony has been an excellent chief of police. He has brought a lot of honesty and integrity to the position and has upgraded our department and staff,” Mayor Patrick said. “He has also been very active and successful in getting grants and he has the respect of all the employees of the police department. I wish him well and hate to see him go,” the mayor added. Our loss is their gain. Best of luck to Chief Burnett. It will be hard to replace someone with such compassion for what he does and for the people he comes into contact with. He has had a positive influence on many young people's lives. Yes, by all means, good luck Chief, and congratulations. I know you will do them a good job. Am glad to see him go thank GOD he his leaveing...Woodbury will be a better place. Tony, not only have you been wonderful for the City of Woodbury and ALL of Cannon County, you have been a true friend to all of us and we are so thankful to have known you. We know you will be happy in your new position and wish you and your family the best!